Back on the mainland, we made a pilgrimage of a different sort. Our friend and travel companion is a golfer, so today we journeyed to his holy grail, the Old Course at St. Andrews. 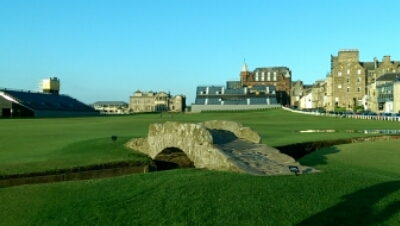 Even I felt a bit choked up when they let us walk out across the green to visit the wee Swilken Burn bridge on the famous18th. 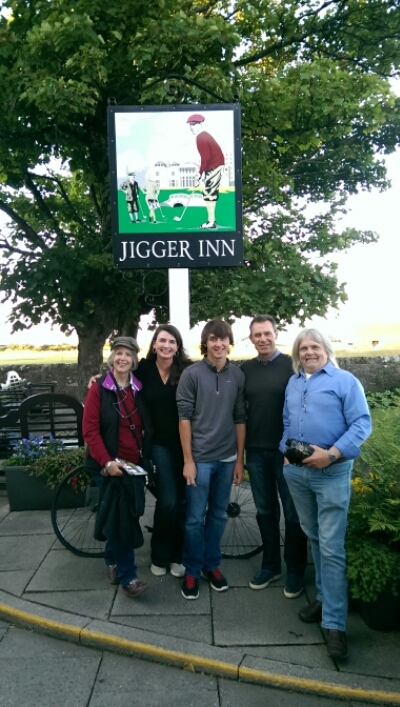 And no visit would be quite complete without drinks at The Jigger, reputed to be the 19th Hole on the course. You don’t want to become golfers, I hope? But seeing that green I could dream of mowing labyrinths therein. No, Erwin, we aren’t going to be taking up golf, but it is so fun when someone shares their passion and opens our eyes to new things. I don’t think anyone will be mowing a labyrinth onto the Old Course at St. Andrews, but I will say it’s the nicest turf I’ve ever seen!